Living in a home comes with great responsibility. Whether you buy a new house or you have lived in your house for many years, you will need to make sure that your home is healthy. One of the ways you can do so is by looking at areas in the home where mold tends to flourish. Often, a house can show the signs of mold but homeowners are unaware of what to look out for. To prevent you and your family from becoming sick, you will want to check for mold periodically. Mold tests should also be conducted if you are considering renting a new house. You do not want to move into a home that can cause great health risks to you and your loved ones. Therefore, to make sure that your home is a happy and safe environment, you must check the most common areas where mold flourishes. One of the most common areas in the home in which mold flourishes is in the bathroom, especially in showers and bathtubs. When you start looking for mold growth, the best place to start in the bathroom is the following areas. Since showers and tubs are always in use, they seldom have time to dry completely between use. Meaning, they tend to be in a continual state of dampness. When you check a shower or tub for signs of mold, be sure to look in places like the faucet, showerhead, and tile. Be sure to also look in less conventional places, like inside bottles of shampoo and soap, and on shower curtains, towels and loofahs. You should also check any bathroom rugs or toilet seat covers. Toilets are prone to mold growth since they hold water. When you inspect toilets for mold, be sure to check not just in the toilet bowl, but also in the tank and the toilet piping. Related Article: Why are home inspections important? As for sinks, they are one of the easiest places to spot mold in the bathroom. Not only should you check the sink and counter for signs of mold, but also inside soap dispensers and toothbrush holders. Also, you should check underneath the sink and along the pipes that run beneath the sink. If any cleaning products are stored under the sink, then you should be sure to inspect them as well. The last area in the bathroom where mold flourishes are on the walls and flooring. If you have any water leaks on the walls or flooring, then you will need to patch them immediately. Water leaks can cause mold to flourish more quickly. 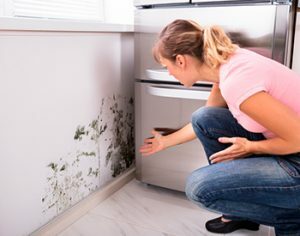 Like the bathroom, kitchens are also prone to mold growth since it is also an area in the house that holds moisture and humidity. When you look for areas in the kitchen where mold flourishes, you should also look in the following areas. Dirty dishes in the sink, wet sponges and kitchen rags sitting on the counter as well as food stuck in the garbage disposal can all cause bacteria to grow, which can lead to a flourishment of mold. Like in the bathroom, be sure to check under the sink, in and around the cleaning supplies, and around the kitchen plumbing. The leftover food that has been rotting away in the back of the refrigerator can grow mold, as can the expired food that is sitting on the shelves of your kitchen pantry. Make sure to wipe down any spills in either your refrigerator or pantry since both can breed mold. Anywhere that you are prone to find food grease, food crumbs and food spillage are prime areas where mold can flourish, such as on stoves, ovens, and microwaves. If you keep these areas soaking in spilled food, then you are creating an environment for mold to grow. Since bedrooms usually do not hold moisture or humidity, you might not think to look for mold in areas in which you and your family sleep. However, since mold can grow anywhere, you should know that mold can breed in the following areas inside your bedroom. Although unlikely to grow mold, you should check both sides of your mattress. You should also check on your bed frame as well as any curtains, rugs, and carpets. Since mold can grow on anything, you should check your bedroom thoroughly. You may think that since there is no running water in your bedroom that it is not susceptible to mold. However, if you have an air-conditioning and heating unit, then you could be growing mold and not know it. When searching your bedroom for mold, but sure to also check every air-conditioning and heating vent. Condensation found on windows and windowsills can cause mold to grow. When inspecting each bedroom for mold, be sure to look carefully at every entry point. The living room is a room in the home where, typically, most families occupy throughout the day and evening. Many meals are eaten in front of the TV, wet and dirty shoes are often left by the front door and houseplants are often overwatered. With all the wear-and-tear living rooms are subjected to, you are creating a room for mold to grow. When inspecting your living room for mold, you should check in the following areas. Mold spores can quickly grow in fabric and upholstery, such as in sofas, chairs, carpets and window curtains. Even if the materials and padding in the living room do not smell musty, you should still check them for mold. Indoor plants are great if you wish to purify the air. However, it is not great to leave plants unmonitored, as they can grow mold. If you overwater plants, you can cause mold to grow. Lastly, when you search your home for signs of mold, you must check the few places that may be seldom used in the house such as attics, basements and garages. These areas are typically prone to poor ventilation as well as darkness and cold temperatures. Therefore, they are likely areas in the home where mold breeds. When inspecting these rooms for mold, be sure to look for mold around any exposed insulation and next to doors and windows where condensation gathers. You must also check near any appliances that retain moisture and humidity, like washers and dryers, and around water pipes and ducting. Finally, it would help if you look next to the water heater and furnace and any air-conditioning and heating vents.